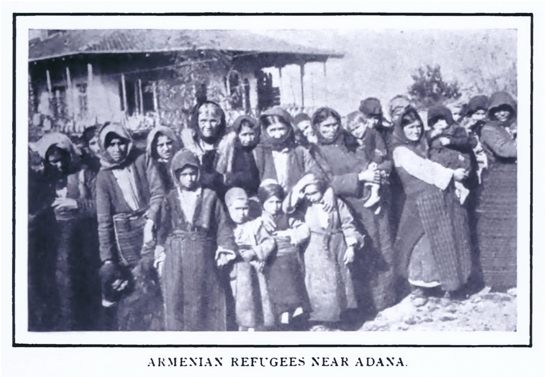 Correction to a Photograph of “Armenian Widows with their Children” Wrongly Dated 1915. It actually dates from 1909. Plus a comment on why it is important to get an accurate ‘paper trail’ for photographs. So far as we know from our research the earliest that the photograph appeared was in The Literary Digest (NY) volume 38, no. 23, June 5, 1909 pg. 957. It may well have been earlier but we have not encountered it. The June 5 article was entitled “Who Will End the Armenian Killing?” See below for a scan of the full page. This enables us to state firmly that any attempt to attribute the photograph later than May 1909 does not stand. In a word, dating the photo as from “September 1915” is wrong. It may well have been used after 1909, perhaps even 1915, but that is another matter. Perhaps the most noteworthy thing about this print is that it is part of the Bain Collection in the Department of Prints and Photographs at the Library of Congress in Washington, D.C. 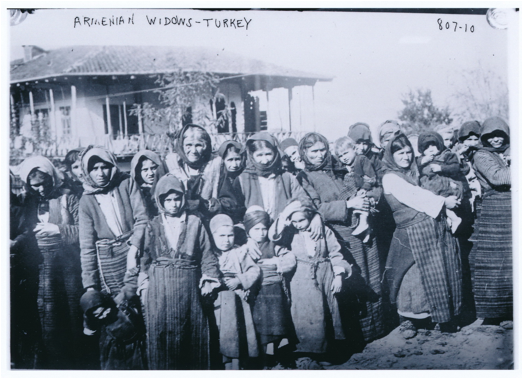 The description to “Armenian widows, with children, Turkey” includes “Date created/Published: 9/16/15 (date created or published by Bain [Bains News Service]).” It seems reasonable that the information accompanying the dust jacket derives from confidence in the Library of Congress Prints & Photographs Online Catalog information which if so, is wrong. We have discussed the Bain collection before in some detail in connection with an ever-increasingly widely used photograph of an Armenian widow and her children. See our “Widowed through Violence, Dirt Poor, Desperate, Burdened with Heart-Wrenching Decisions Concerning Her Three Children: the appalling woes of an Armenian woman from Geghi [Գեղի] (Erzerum Vilayet) after the Hamidian Massacres: A publicity photograph of 1899” posted on Groong, Armenian News Network, September 7, 2015. The Bain Collection is described in Endnote 8 and an authoritative reference citation is given from one of the specialists at the Library of Congress who is especially knowledgeable about it. 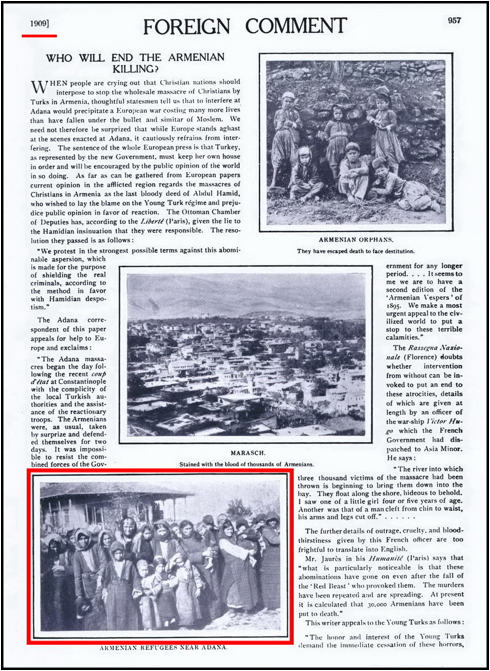 A brief word is in order about photographs used on covers of scholarly works dealing with the Armenian Genocide. We recognize and appreciate that there are many ideologies of remembrance, and many views on what symbolism is appropriate for this remembrance. Many might argue that there is no appropriate symbolism, and thus the most respectful and tasteful approach is to keep things simple and direct. No imagery. If on the other hand, some semblance of appropriate symbolism is to be adopted, we would urge that it should at least be fully relevant, and as accurately attested and attributed as possible. Getting back to the photograph in question, we confess that the widowed women and children nominally representing the Armenian Genocide in some direct or perhaps subtle or even obtuse way or other escapes us. A fair amount has been said about “gender-specific” aspects of the Armenian Genocide. This photo might be taken to suggest that women and children were somehow given special treatment, and only fighting-age men were murdered. This is simply not true despite what some self-styled experts and pundits may have opined. The well-known, vicious and varied patterns of genocide are in no way evasive. On the other hand, what is to be interpretable from a photo of widowed mothers with their children? This is not simply a question posed by those of us who do not hesitate to be polemical when we think it is required to knock some sense into a situation. We went close to berserk when we encountered the expression “Existential genocide” in a nominally scholarly article on genocide – mercifully not relating to the Turkish Genocide against the Armenians. The phrase means nothing to anyone with half a neuron! Back to the point, it is of interest to us that the French edition of this work, the original publication in 2006, did not utilize the photograph of Armenian Widows that we have spoken of above. Instead, the publisher apparently saw fit to utilize a color post card issued in 1908 to commemorate the restoration of the Ottoman Constitution with Sultan Abdul Hamid II as the focal point, and the emphasis on the theme “Long Live the Constitution, Liberty, Equality, Fraternity” [in French as used on the post card, Vive la Constitution, Liberté, Egalité, Fraternité (minus acute accents on the post card we own at least). The Armenian language ‘banner’ reads Getseh Sahmanatrutiun, Azadoutiun, Yeghpayroutiun, Havasaroutiun [Long Live the Constitution, Liberty, Fraternity, Equality; note the difference in order]. The other banners are in Greek, Turkish, French, and Ladino [Judeo-Spanish in Hebrew characters]. What we are ‘hinting’ at is that this imagery is not very informative either. In fact, the printing is so tiny, that without a magnifier, one cannot read it. The imagery, while colorful, certainly would not elicit, we believe, any measure of reaction from the average viewer. It would be a long jump from the promise of the restored Constitution to the failure and reality of a State-organized and perpetrated crime as heinous as Genocide. So, where are we left and what are we to conclude? We have slowly but surely come to the conclusion that authors of very fine books are left open to criticism because “production” matters are rarely left to authors. Parceling out chores to those who may have talents in graphic design but little specialized knowledge of photographs and their interpretation does not help matters either. The same might be said of photograph selection as well. Errors creep in. Sometimes they exceed the mark and end up, accidently or by design, being protected by copyright. We shall not go there either, just now. Again and as we have stated time and time again, the reality of the Armenian Genocide does not rely on photographs or imagery. It would be nice, however, if people would be a bit more careful in their selection of illustrative matter. Many University and scholarly libraries remove dust jackets from hardback books. These are frequently discarded. We personally do not like this practice and merely state that in so doing, one frequently loses ready access to information that might have instructive value. So far as we know the soft bound copy of the English-language edition has not appeared. If it ever does we hope more attention will be given to the choice of imagery if imagery is used. As we have said before, we decided long ago that the area of attestation and attribution of photographs needs considerable work to get matters into shape. This is yet one more tiny step to clarification of deficiencies. The Library of Congress has always been direct in seeking input from those who have modifications or additions to be made to their catalog descriptions. Publishers on occasion are sensitive to criticism. Copyright 2015 Armenian News Network/Groong. All Rights Reserved.